Intraspecific competition, then, can have a profound effect on the number of individuals in a population; but it can have an equally profound effect on the individuals themselves. In populations of unitary organisms, rates of growth and rates of development are commonly influenced by intraspecific competition. 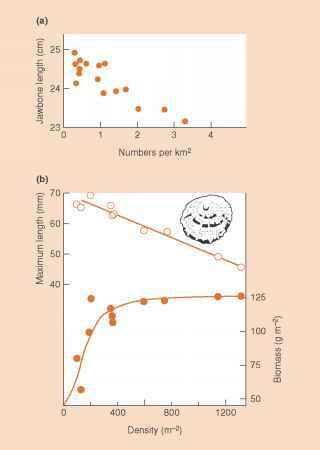 This necessarily leads to density-dependent effects on the composition of a population. 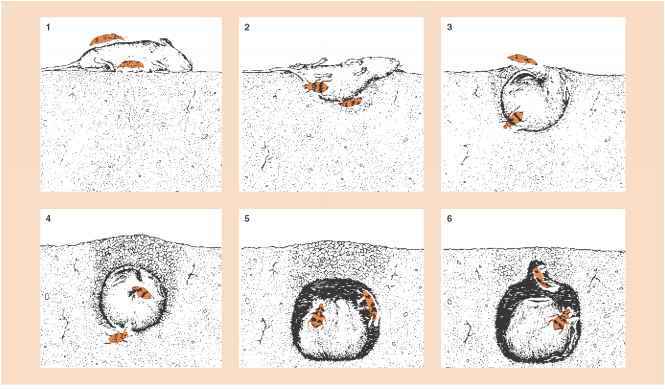 For instance, Figure 5.12a and b shows two examples in which individuals were typically smaller at higher densities. This, in turn, often means that although the numerical size of a population is regulated only approximately by intraspecific competition, the total biomass is regulated much more precisely. This, too, is illustrated by the limpets in Figure 5.12b. Such effects are particularly marked in modular organisms. For example, when carrot seeds (Daucus carrota) were sown at a range of densities, the yield per pot at the first harvest (29 days) increased with the density of seeds sown (Figure 5.13). After 62 days, however, and even more after 76 and 90 days, yield no longer reflected the numbers sown. Rather it was the same over a wide range of initial densities, especially at higher densities where competition was most intense. This pattern has frequently been noted by plant ecologists and has been called the 'law of constant final yield' (Kira et al., 1953). Individuals suffer density-dependent reductions in growth rate, and thus in individual plant size, which tend to compensate exactly for increases in density (hence the constant final yield). This suggests, of course, that there are limited resources available for plant growth, especially at high densities, which is borne out in Figure 5.13 by the higher (constant) yields at higher nutrient levels. and thus, a plot of log mean weight against log density should have a slope of—1. Data on the effects of density on the growth of the grass Vulpia fasciculata are shown in Figure 5.14, and the slope of the curve towards the end of the experiment does indeed approach a value of—1. Here too, as with the carrot plants, individual plant weight at the first harvest was reduced only at very high densities - but as the plants became larger, they interfered with each other at successively lower densities. The constancy of the final yield is a constant yield and result, to a large extent, of the modu- modularity larity of plants. This was clear when perennial rye grass (Lolium perenne) was sown at a 30-fold range of densities (Figure 5.15). After 180 days some genets had died; but the range of final tiller (module) densities was far narrower than that of genets (individuals). The regulatory powers of intraspecific competition were operating largely by affecting the number of modules per genet rather than the number of genets themselves.